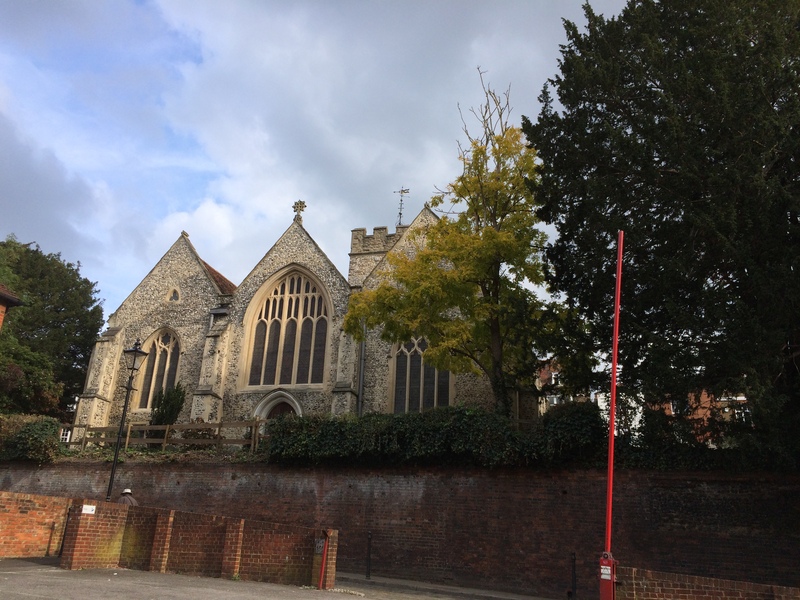 We rarely go to Guildford, although it is only about 8 miles from us, but on Sunday we were invited to a birthday lunch for our little grand-daughter who goes by the geocaching name of Honeyrobbinn when she is with us. Being us, Cockrobbinn and I arrived early. I am early for absolutely everything…… All dressed up and no-where to go (not quite but…..) I decided to look at my phone to see if, by chance, there was a geocache nearby. EUREKA ……… only 350 metres away was a Church micro and it was the only traditional cache in the nearby vicinity. Off we went with high hopes as we could see the roof of the church over the tops of nearby houses. Church Micro 100 – Guildford St. Marys – a straight-forward micro – was at the church in Quarry Street which is the oldest surviving building in Guildford and is almost certainly the original church of the town. The Saxon settlers in the area became Christians during the 7th century AD and would at first have built a wooden church, very probably on the present site. The present stone tower was built between 950 and 1100. The first two gates we came across were still 80m from ground zero so we wandered around to a little back street and came across a small rear entrance to the church with a metal gate. Craftily hidden beneath the gate by an attached magnet was the cache. 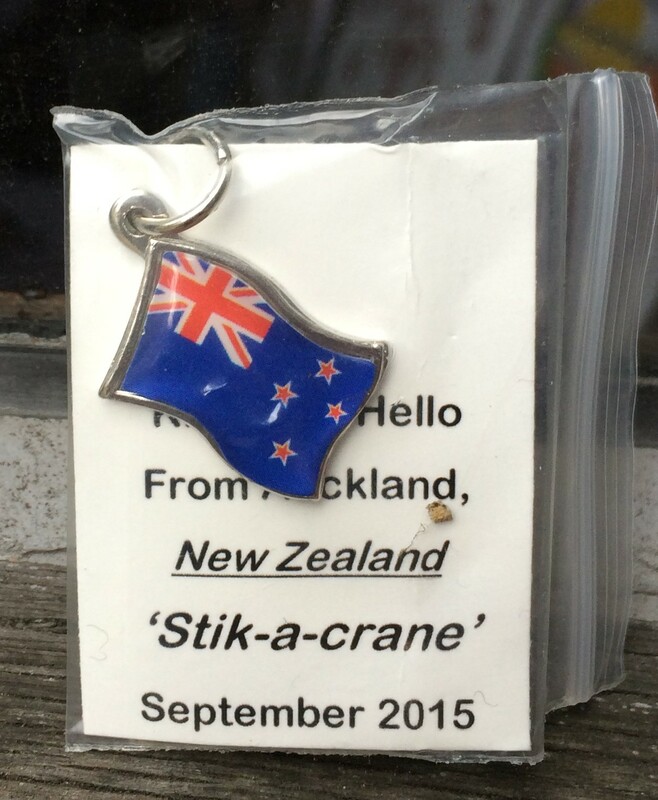 OK – just an ordinary little black pot but when we opened it to find the log, out fell a small polythene bag with two little mementos from New Zealand – the NZ flag for a keyring and an origami crane bird (White Faced Heron to be precise). 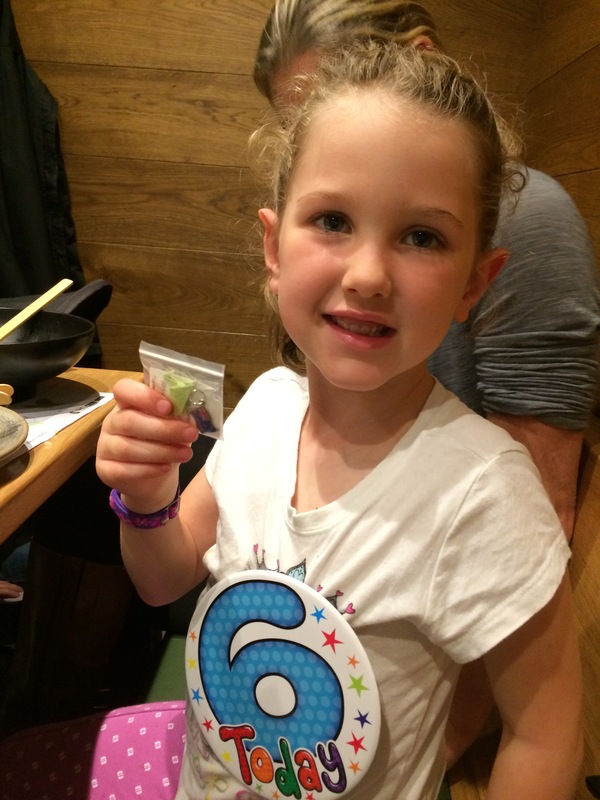 Anyone who reads my blogs may remember that my little grand-daughter, Honeyrobbinn, is half Kiwi !!!!! Needless-to-say, we were amazed at the coincidence of finding a New Zealand souvenir on our way to meet our little Kiwi grand-daughter for her birthday lunch. As we hadn’t planned to do any geocaching, we didn’t have our geobag with us full of exciting goodies for swapping but I delved deep in my handbag and came up with a couple of small items that would fit into the film case so that I could make the swap. Honeyrobbinn loved the flag and origami crane bird and also the story of how we found it moments earlier. 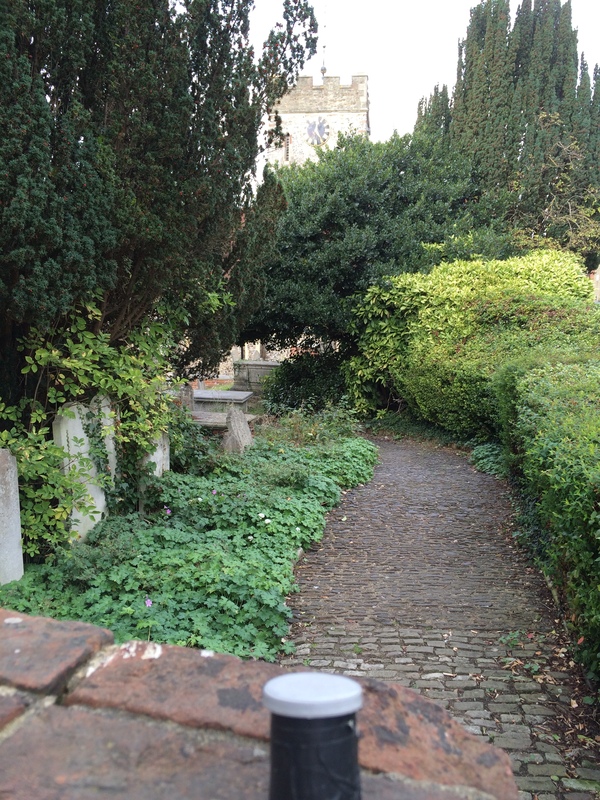 This geocaching adventure took place on Sunday, 18th October 2015. This entry was posted in Church Micro, Geocaching, Guildford, New Zealand, Souvenir and tagged Church Micro, Geocaching, Guildford, Log Book, New Zealand, Souvenir. Bookmark the permalink. 2 Responses to Coincidence or What ? Ooh, aren’t you lucky… if we’re out and about we never have enough phone signal to get it to download caches, so we have to be organised and look before we leave home. Like we’re that organised…. BOL BOL. I think we must be lucky. I never download caches to my iPhone before we go out caching. Never had a problem viewing them. Husband has to with his Garmin and its so annoying if we haven’t downloaded the right area!